Senior investors must consider income needs and risk tolerance. 1. Should I Withdraw My Bond Funds Before My Stock Funds in Retirement? Senior citizens, whether they are retired or still working, have many financial issues to tackle. It is important for senior citizens to budget for everyday living expenses as well as manage an investment portfolio that will provide them with enough to live on in the years ahead. They also need to minimize how much they pay to the government in taxes. A solid investment portfolio is more important than ever for senior citizens, because they will likely be living off their investments. Senior citizens must be careful about chasing investments that have historically delivered higher rates of return -- such as stocks and commodities -- because those investments tend to be riskier in the short term and could decline in value. Government and corporate bonds, money market accounts and bank CDs are safer places to park money for senior citizens. On the other hand, not taking enough risk can, ironically, be risky in itself. If the return does not keep up with the rate of inflation, the nest egg could lose purchasing power over time. Senior citizens must carefully balance the return they need with the risk they might be exposed to in pursuing a higher-return investment. Senior citizens can receive current income from their investment portfolios in the form of interest income from bonds and bank accounts or from stock dividends. Dividends are profits paid on a regular basis to owners of publicly traded stocks. Based on their risk tolerance, seniors should balance the amount of their portfolios they need safely stored in bank accounts and bonds with stocks that could potentially provide a higher rate of return. Some stocks offer regular dividends as well as the chance to sell the stock for more than its original purchase price. The key to asset allocation for senior citizens is diversification. Diversification is the best protection against risk when the investor cannot afford to take heavy losses on one or two assets. A portfolio should be created for a senior citizen based on his tolerance for risk. Risk tolerance varies for each individual based on the size of her nest egg, her age and expected life span, and how much she will need for living expenses. It could even come down to whether a person has a more conservative or aggressive personality when it comes to her investments. For example, a conservative senior citizen might choose an asset allocation that has 40 percent stock mutual funds, 40 percent bond mutual funds and 20 percent bank CDs. A more aggressive senior citizen might be comfortable with an investment portfolio consisting of 35 percent bonds and 65 percent stocks. With the exception of investments in tax-sheltered retirement accounts, the interest, dividends or capital gains produced by an investment portfolio is usually taxable in the year it's earned. However, if a senior citizen has funds invested in a Roth IRA, he can avoid all taxes on gains because the contributions already have been taxed. Withdrawals from 401(k)s and traditional IRAs are taxed at ordinary income tax rates. With money invested outside retirement accounts, seniors should choose investments that match their tax situation. High-tax-bracket seniors should consider municipal bonds that are exempt from federal taxes and free of state taxes if issued by the state they live in. High-tax-bracket seniors also should avoid investments that pay interest income and distribute short-term gains, such as taxable bonds and bank CDs. 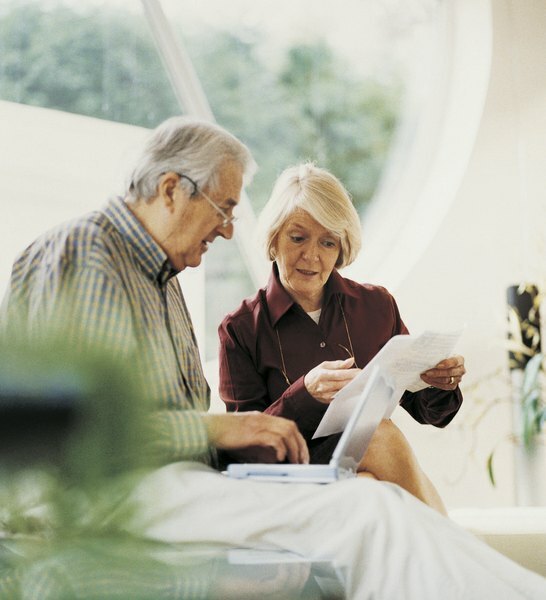 Seniors in high tax brackets should consider growth-oriented investments like stocks. Stocks are taxed at a lower rate if they are held more than a year. What Mix of Mutual Funds to Put in an IRA?